If you’re one of the two-thirds of homeowners who are planning on renovating, you may be wondering what you can do to improve your current living space. From added bedrooms to entertaining areas, the possibilities are endless when it comes to home remodeling. However, there is one remodeling project that can bring that extra wow factor to your home: a home theater. If you’re considering looking into some of the best home theater installations Northern VA has to offer, this article is going to discuss a few important features you shouldn’t forget about. Lighting: Bad lighting can completely ruin a movie-viewing experience. Because of this, it’s important to install lighting that will help direct brightness away from the screen. This will eliminate annoying glares on the screen. If you want one of the best home theater installations Northern VA residents have ever seen, the right ambient light is an absolute must. There should be enough lighting to still see around the room, and avoid tripping or falling, but not enough to ruin the movie. Additionally, try to avoid having many windows, or invest in blackout curtains to keep out the light. Sound: Sound is absolutely essential when it comes to home theaters. It’s important to not only consider the speaker setup you plan on implementing, but how the materials in the room will affect the sound as well. So to get the best movie-viewing experience possible, it’s important to invest in a spectacular surround system. After you’ve got that, now it’s time to think about how to make your theater as sound-absorbing as possible. To do this, you should consider what kind of flooring and wall materials you’ll be using. Carpet is a great option because it not only makes the area cozier, it helps absorb the sound. And while regular drywall is just fine for home theater walls, there are special panels that can make the sound even better. Layout: Many homeowners don’t really think about the shape and layout of the room they’re planning to install their home theater in. In doing this, they’re risking having a poor movie-viewing experience. For optimal viewing, rectangular- or square-shaped rooms work best. With these shapes, the screen can be against a wall at one end of the room with seating at the other end. This layout will also help with acoustics in the area. Overall, try to avoid random placement of seats or too-open areas. What better way to bond with family and friends than to have a stellar basement home theater? 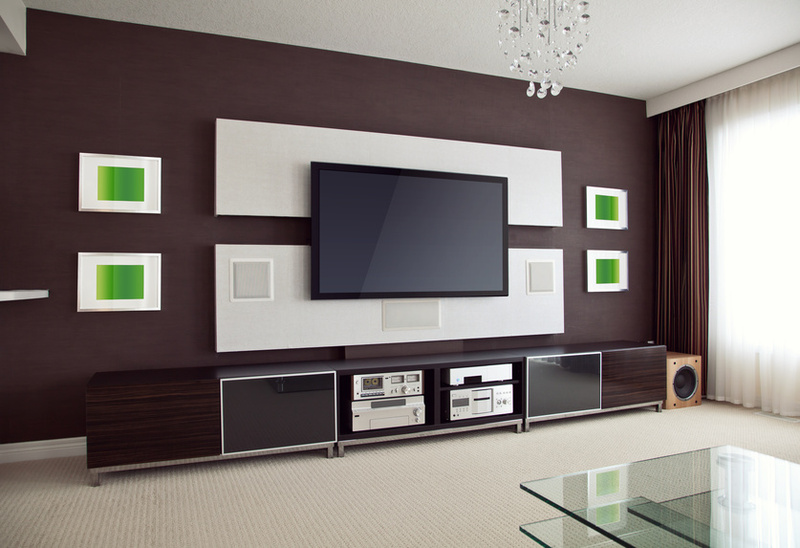 If you remember to keep these important features in mind, you’re sure to have one of the best home theater installations Northern VA residents have ever seen.